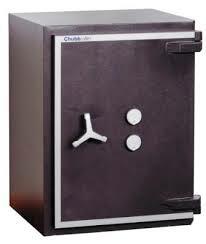 The Chubb Trident safe range offers high standards of protection for burglary, fire and explosives. The cash ratings range from £60,000 to £150,000 depending on the model of Trident safe selected. These robust and reliable safes can be fitted with different locking systems and will keep your valuables safe from intruders. Available in 7 different sizes for each grade and can be customised with locking and fitting options -please contact us for more information. Please contact us for a competitive quote by phoning 0117 967 4994.